When Hasbro’s team of all-female Transformers arrives (and sends irrational people everywhere into conniptions about gender roles in Cybertronian society), they won’t just be hitting the comics: Hasbro has announced a second Transformers exclusive toy for San Diego Comic Con, and it’s all about the ladies. 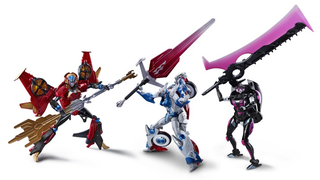 This isn’t the first plastic rodeo for Arcee, Chromia and Windblade, who have all had figures released before, but these are the first based on their new designs appearing in Combine Hunters, where they’ll team up for the first time later this year. Revealed on IGN late last week, the box set will feature all three Deluxe-scaled figures in their new colours, some new accessories based on their gear in Combine Hunters (like Arcee’s fancy, hot pink sword), and an exclusive variant cover for Combiner Hunters #1 by Sara Pitre-Durocher. Although there aren’t any particularly major design changes outside of the colour schemes, it’s cool to see Hasbro react so quickly to getting some toys out there for this new team. Let’s hope that they’ll find away to a wider release after Comic Con is over, either individually or as a set. The Combiner Hunters box set will be available for $75 at Hasbro’s booth at SDCC next month, with a limited number going on sale on HasbroToyShop.com shortly after.